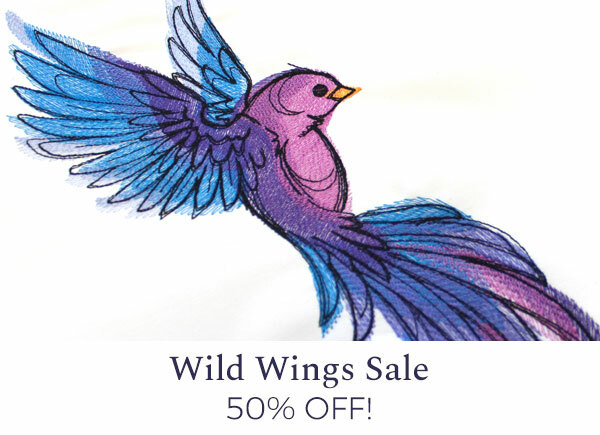 Wild Wings take flight in this week's sale on select machine embroidery designs. The beautiful stitches of soaring crests, mysterious owls, and other feathered friends are gorgeous additions jackets, pillows, purses, and more. Through Monday, April 29 at noon Central time, get these select designs on sale -- 50% off! Don't miss out on the illuminating designs of a Beautiful World. Ethereal sea creatures and soaring stitches will take you on an adventure from ocean to sky as you create pillows, jackets, purses, and more. Through Friday, April 26 at noon Central time, get these new designs on sale -- 50% off!